As a past pupil or parent, we hope that Copthill holds many happy memories of the friends you made and a unique Copthill ‘experience’. This year we are celebrating our 50th Anniversary and we are holding a number of events throughout the year to give an opportunity for former staff, pupils and parents to celebrate. 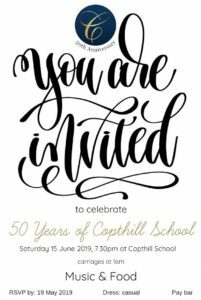 We would like to invite you to our 50th Birthday Party on Saturday 15 June 2019. We would be delighted to see you for an informal evening of Street Food, a pay bar and dancing, from 7.30pm. The celebration is strictly invite only and we regret that all attendees must be over 18 years old. Please follow this link to complete the form https://goo.gl/forms/BUYoC9lsREjvt73U2 and we will send you a personal invitation and details regarding the evening. Numbers are limited and the closing date is Sunday 19 May 2019.